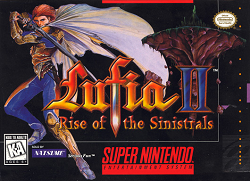 This game was released in 1996 and is a sort of sequel to the original game, Lufia and the Fortress of Doom. As far as the order in which these games were released are concerned, this is a sequel. However, if you look at this game through the lens of plot, this game is actually a prequel as it took place 100 years before the events of the first Lufia game. To borrow from a social networking meme, it’s complicated. As mentioned, the plot of this game follows the main protagonist, Maxim. One of four characters that appeared at the beginning of the previous game. A strange light appears in the sky and he is to investigate. While the maximum size of the party is four, he is joined by more than four characters. These characters include Tia, Selan, Dekar, and Lexis to name some of them. Ultimately, Maxim goes up against Gades and he is quested to defeat him. Things get complex when a mysterious woman appears and disappears throughout his adventure. It isn’t until towards the later portion of the game that all four Sinistrals are revealed and plot points become connected between the two games. If you’re like me and have played the other game, you’ll notice plenty of connections between the two games. The four party system and the menu-based battle system remains largely the same. What’s new is the IP bar. I thought IP stood for Item Power, but some sources say it stands for “Ikari Points”. As you take damage, your IP bar fills. If you have an item equipped that has an IP technique, you can spend your IP on that move. These moves can either deal a special kind of attack on an enemy or give you positive benefits while in battle. Some weapons, for instance, have an ice-based attack as an IP power. If an enemy is weak against ice, then using this attack is especially advantageous as this attack will deal far more damage than a regular attack. Some IP techniques require you to spend a portion of your IP bar, but the items with the more power IP techniques can use up your entire bar. The only real way of knowing the cost is selecting the flame in battle and seeing if you can use it (white letters) or not (blue letters). If you’ve played Final Fantasy 7, the idea is somewhat similar to the point break system, but you have much more control over it and it’s much more nuanced in this game. If Final Fantasy 7 borrowed the idea from this game, it wouldn’t really be a surprise to me as it does add a very interesting dynamic to this game. There’s a lot of familiar elements in this game. You can pick up treasure in caves and buy items and equipment in stores. Red chests contain regular items while blue chests contain special items (keys to the dungeon is a very common example of what’s found in the blue chests). A vast majority of the spells you learn in this game are bought through the store. Some come with the characters and can even be gifted to you. So, spells aren’t just learned while you level up. Leveling up is a pretty standard thing in RPGs and the level up system is very similar to numerous other RPG games. In fact, it’s exactly the same system as the previous game where you gain experience and your stats go up. The level up and what you gain is shown in the window at the end of a battle if you’ve earned enough experience. These stats can be looked at in more detail through the menu system. One criticism I gave the previous game was that the spells are very oddly named. In fact, it can be downright confusing trying to figure out what each spell does based on the name alone. This forces you to sometimes look at a description of the spell before you can make an informed decision. Everything was seemingly carried over to this game verbatim, so my criticism remains the same for this game as well. Examples of this include Rally as a revival spell. I would have thought Rally might increase fighting power if I went by the name alone. Trick apparently raises a characters attack power. If I went by the name alone, I would have thought this would be a confusion spell you cast on an enemy. A third example would be strong. Strong restores some of your hit points. I would have thought this would raise your fighting power if I went by name alone. There’s plenty of examples of this, but either way, the naming of spells just added a layer of unnecessary confusion if you ask me. What makes this game intriguing, on the other hand, was the level design. I would normally criticize a game being so seemingly linear, but what happens in the levels themselves more than makes up for any sense of linearity found in this game. In the dungeons, there are numerous puzzles that need to be solved. A vast majority of the puzzles have a difficulty that is neither overbearingly hard, nor can you just roll through them without any sense of challenge. Most of these puzzles force you to sit and think how you are going to solve them. This light challenge really spruced up the gameplay. There were about 4 puzzles that ended up being a bit much and I had to resort to a guide to get through them, but considering the number of puzzles found in this game in the first place, this actually isn’t that bad and the guide ended up being something to help nudge me along in the game more than anything else. Those puzzles include the weak floor and two pots puzzle and the growing grass with fire arrows puzzle. What I found interesting was the inclusion of a particularly difficult optional puzzle. This is known as the hardest trick in the world puzzle. I thought the puzzles already in the game were certainly sufficient, but the inclusion of this optional puzzle was a nicely played idea on the part of the developers. I personally didn’t have a hope in the world of solving it and agree it is a puzzle that is incredibly difficult to solve. So, if you are very good at puzzle games and would like a very big challenge, that puzzle is definitely for you. So, a little something for everyone as far as this game is concerned. Another interesting element put in this game are moves very similar to those found in The Legend of Zelda – A Link to the Past. Contrary to what some say, these moves aren’t merely found in a number of Zelda games previously made because neither Zelda II – The Adventure of Link nor The Legend of Zelda features this. To my knowledge, it wasn’t until The Legend of Zelda – A Link to the Past were these moves featured. These moves include the famous sword swing to cut long grass and picking up and moving pots. In this game, these moves revolve more exclusively around solving puzzles than finding items and rupees and defeating enemies. The same can be said with the special items like the hammer and arrows. Bombs are also featured in this game and are most often used for blowing up holes in the wall or floor. Sometimes, they are also used to blasting crates for the purpose of timing a switch to be no longer depressed. Another interesting aspect is that enemies appear in dungeons and are not merely random encounters. For every square you move, every swing of the sword, and use of an item, an enemy can move. Some enemies move as fast as you do. Others move slower. A very small number move faster than you. If you manage to touch an enemy, you can (though not always) go into battle with them. While the intro dungeon suggests that you will encounter situations that require you to defeat every enemy in the room, this, in actuality, is a very rare occurrence. As a result, I thought this was a little underutilized. It’s possible to temporarily stun enemies with things like arrows and hammers. While this is an interesting feature, I never ended up using this a whole lot because I thought the collection of gold and experience points was more important. Some rooms do re-populate once you leave, but others do not. The only time everything truly repopulates is when you leave and re-enter a dungeon. Regardless, you can, as a player, choose to either engage in lots of battles or simply evade enemies altogether. The last time I saw this kind of think was in Final Fantasy: Mystic Quest and when I played that, I thought this was an interesting element in that game as well. One final part of the game is the use of capsule monsters. There is a sort of monster training element thrown into the game that may resemble the earliest Pokemon games. The Pokemon game series started in the same year as this game. Essentially, there are a small handful of monsters you can collect. They have level building similar to your characters. The key difference is that they are automatically controlled. You can’t control and most heal spells don’t touch them (unfortunately). You can only use one of them at a time. They’ll have up to three special abilities as well as the ability to defend and attack normally. Each capsule monster represents a certain element with the exception of the first. The first capsule monster doesn’t actually represent any particular element and is considered neutral. What you can do with these monsters is feed them so they can evolve into higher life forms. Each monster has four stages of evolution as well as a “Master class” if you feed them a particular fruit at a particular stage in their development. What the fruits are and when you feed them is either trial and error or a case of researching it online. What you feed them is more often then not is absolutely strange. You can feed them swords, helmets, rings, rocks, and shields among other things. They also tend to have expensive tastes, so as you fill the feed meter, you’ll notice that you gain more squares with more expensive equipment. If they evolve two or three times, chances are, most of the stuff you have left over in your inventory will yield no benefit. Monsters to get better random actions as they evolve, but it can get expensive quick feeding these things. I did end up bringing two capsule monsters up to master class, two to level 3 and the rest were found, but only brought up to level 2. Suffice to say, capsule monsters can help ensure that you never run out of reason to spend money in this game. While this adds a level of complexity to the game, it wasn’t that big of a deal. I ended up thinking that this added an interesting dynamic to the game. Capsule monsters recover all health between battles. So, even if they die in battle, they’ll be there for the next battle as if nothing happened. Plot is a pretty big thing in this game. Overall, I thought this game had its highs and lows. More often, there were highs such as some of the dialogue and how events played out. The inclusion of certain elements in the beginning being brought back later in the game was nicely done. There were a few lows in the writing as well. The game decided to offer a borderline movie on when Maxim and Selan got married and have a kid (thus fulfilling the plot requirement for the next game). I thought the movie was excessively long and could have been pared down to a few critical points before heading back into the actual game in question. The way this part was presented in this game gave this game an awkward feeling. Fortunately, the plot does get back on track when you regain control of your characters again. Another part of the game that I thought the writing was awkward was giving the duel blade awareness so that it became a small character in the game. This wasn’t really a thing in the previous game and Duel Blade having a conscious was more a bizarre writing misstep than an interesting plot twist. So, overall, I thought the plot and writing had its share of stumbles along the way, but it does redeem itself with things like the character development of playable characters. The difficulty balance was interesting. As a general rule, training is something you really don’t need to do much of. This was excellent because when hours of training is required in an RPG, it reduces the experience of the gameplay. Training is optional and can help make the game easier later on, but it, for the most part, isn’t that necessary. The only time I found that training of any kind was really required is when you first acquire Dekar. I thought the level he was at when he first joined your party was a bit too low. Still, it’s only an hour or so of training that is required to get him up to speed. The only other training I thought was very helpful was training Maxim up at the very beginning a little. This was to help him survive the early stages until he acquires a second character in the party. Having said that, this game does suffer from the problem of constantly swapping out characters found in Final Fantasy IV. So, if you find a whole bunch of stat raising potions, you have to be careful who you give those potions to. This is because that character could forever leave your party and never come back – thus essentially wasting that potion. Also, any training you put into that character also winds up being wasted. The good news is that if you are familiar with the previous game, you’ll know which characters will be with you at the end of the game. You will have access to some of these characters fairly early on, so not all is lost. So, this game does suffer from constant swapping out of characters, but to a lesser extend in my view. Ultimately, the balance was nicely done. Grinding can be done to help make your game easier, but it is, for the most part, not that necessary. As a result, this game can be quite enjoyable on this front. The only real disappointment in terms of difficulty is the final bosses of the game as some of them were just way to easy. One thing I have been genuinely surprised by as far as the writeups I’ve seen about this series is that so few mentioned the first game. A lot of focus seemed to be devoted to this particular game instead. It’s surprising because I didn’t think Lufia and the Fortress of Doom was all that bad. It had its downsides, but it was a pretty decent game to play overall. When I played this game, I could see why more people emphasize this game because the gameplay is much more intriguing. Still, even if this game is better, I would actually recommend trying the Fortress of Doom first before playing this game. The reason for this is because you can make the plot connections and a lot of what is in this game will make more sense. If you simply play this game, some of the significant plot points in this game will very likely go over a players head. So, play the previously released game first and you’ll have a better experience with this game. IF you have that option, that is my advice if you’ve never played the series before. Another great feature that I just didn’t have time to explore is the inclusion of the optional ancient cave. My understanding of the cave is that this is a randomly generated dungeon and you can go from level 1 to level 99 (the level cap in this game). It is possible to pull extra loot out of this dungeon and use it for the rest of the game. The dungeon is also massive because it has 99 floors. I definitely regret not attempting this and am guessing it adds a lot to the overall experience of the game. It may even be a whole game within this game. The other feature in this game is the fact that you can play in the “retry” mode. I did play a little of it and found myself gaining levels much more quickly. According to one source, you get four times the experience and gold you would normally get in the regular mode. While it may sound backwards to make the game easier on the next try, I think that might actually tempt gamers to try this mode to see how the game play out the second time. So, there is another method to entice gamers to keep playing. If I wasn’t on a time budget, I would certainly try the retry mode as well as play the ancient cave under this mode. Another interesting element is the fact that there is seemingly no treasure found in houses. This is probably one of the few games that doesn’t have treasure in town houses. It’s sort of against the grain of many other RPG games. On the one hand, it makes this game a bit more realistic because you are essentially pillaging towns along the way in other games. On the other hand, you have very little reason to even enter these houses outside of a few rare moments of advancing the plot. As a result, some of these buildings are essentially time wasters at best. To add to things, there are minigames found in this game. These are largely found in the casino. While this was seemingly a cool addition at first, I quickly found that the caps on betting were far too low. Most games cap out at around 99 chips a bet. There is one slot machine that allows you to make 100 chip bets, but that’s about it. When a top prize costs 500,000 chips, it takes way too much time to simply play for the prizes. You’re better off simply grinding, earning the cash, then paying for the chips outright to get the prizes. At least you get the experience points in the process. Still, these games can serve as a nice distraction from the regular adventure, though I never really played the games too much myself given the number of puzzles to solve in the main quest. Even though the top prize is the best weapon in the game, it’s really not worth it to spent the time and effort to get it. By the time you earn 5 million gold, you are already looking at your characters reaching the high 80s in levels. You don’t even need the weapon because your levels are already overpowering to the point that a vast majority of the game’s difficulty is way too easy. So, an interesting addition, but not a huge thing in the grand scheme of things. Generally speaking, I thought this was a pretty good game. There was a few stumbles in the plot along the way, the swapping out of characters did throw a bit of a kink into the gameplay, and some gentle nudging from a guide may be required from some of the more difficult puzzles, but I generally found this game enjoyable. Graphically, this game does seem pretty solid with the effects and overall look and feel. At the same time, this was released on the same year as Super Mario 64, Wave Race 64, and Crash Bandicoot. As a result, this game unfortunately was released when 3D games were in full swing and the next generation consoles were starting to take over. So, taking that into perspective, while there is plenty of improvements in this game over the previous one (such as enhanced backdrops in battle sequences), this game ended up being a case of too little, too late as far as graphics were concerned. Good for a SNES system, not so great compared to other console games at the time. The audio was surprisingly disappointing in this game. The sound effects were pretty decent. Unfortunately, a lot of the music was seemingly scaled back. Things like port town music and the final dungeon were great highlights in the previous game. In this game, the port town melody was reworked. The end result was that it wasn’t exactly anything special. The bigger disappointment was the reworking of the music in the final dungeon. The music producers didn’t have to change a darn thing in this track. Just re-release it in its entirety unaltered in this game and all will be good. Unfortunately, whoever composed the music decided to fix what wasn’t broken and ended up scaling back the track. The track was good, but not as great as the previous game. The music in this game was pretty decent, but the only highlight I found in this whole game was the boss music. Even the final boss music wasn’t exactly a highlight for me. Overall, there is a lot to appreciate in this game. You have a new IP system, some minigames, puzzles, abilities, and capsule monsters. The plot does have a few stumbles along the way, but the storyline was pretty good. Outside of the IP system, I don’t think there was anything too groundbreaking in this game with the various special items you can collect in this game. What is great is how this game does retool and configure all of these elements into a nice cohesive game. Graphically, this game does seem solid on the surface, but when comparing it to other console games at the time, it’s not quite as impressive. Yes, it is a much needed improvement, but it ends up being a case of too little too late because 3D gaming had already arrived in mainstream consoles by then. The music was sadly scaled back and the only memorable song ended up being boss battle music. This game is definitely worth playing as it was a great game. You can spend many quality hours with it. Unfortunately, it is a bit behind the times. Furthest point in game: Defeated the four Sinistrals (beat the game). Found 8 dragon eggs, but didn’t find the dragon. Didn’t attempt the ancient cave, but did toy around with retry mode for a few minutes. Spent nearly 40 hours in this game, but it could have been less because I made the mistake of trying to obtain the dragon blade through grinding. Three of the four characters reached level 99 and the capsule monster I had reached level 98.